Phrases like “Think Global, Act Local” and “Global Health is Local Health” are catchy, but it’s sometimes difficult to figure out what they really mean. 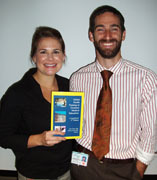 Child Family Health International (CFHI) Medical Director, Jessica Evert MD, presented Primary Care Grand Rounds at UCSF/SFGH Medical Center on just that topic. Flanked by colleague and fellow Family Physician, Jack Chase MD, both co-editors of the second edition of the Guidebook on Global Health Training In Graduate Medical Education, Dr. Evert described the ethical underpinnings and practical implications of the globalization of the medical discipline, specifically for those practicing and working to address health disparities within and between countries. Dr. Evert discussed the variety of ways individuals can ‘practice’ global health, many of which lay down the stethoscope and clinical service in preference of advocacy and community-based capacity building. Examples of this include efforts to increase the social accountability of medical schools, advocating for ‘global health’ training efforts that train local individuals to address their own communities’ health challenges, rather than Westerners, an approach used by schools belonging to the Training for Health Equity Network. In addition, efforts towards this approach include those of Erica Frank to increase the accessibility of free web-based health education resources, and the World Organization of Family Doctors (WONCA) that disseminates a cost-effective, evidence based model of Family Medicine. Dr. Evert discussed pivotal reform-driven efforts such as the Lancet Commission’s report Health Professionals for a New Century which emphasizes the need for medicine to have a closer synergy with public health, health systems, and social accountability. In both domestic and international settings (both local and global health) there are consistent themes of bringing medicine into the community and out of ivory towers. CFHI Global Health Programs are an opportunity for students and others to see connections between local and global health firsthand, as well as be a part of the movement to appreciate the bidirectional benefits of global engagement, where both sides of the partnership, those from developing and developed worlds, can learn from each other and where “reverse innovation” is not only possible, but necessary to ensure health for all.